Laxmi Ganesh Silver Coin Hamper (20 Grams) Gift your near & dear ones wealth and prosperity with this beautiful silver coin hamper specially designed for this Diwali. 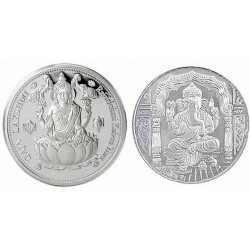 Hamper Contains : • One piece silver coin with lord Ganesh embossed. • One piece silver coin with goddess Laxmi embossed Product Features: • Silver weight: 20 grams (10grams each) • Silver purity : 92.5% • Coin shape • Usp of the product: Jagdamba pearls offers you a wide and attractive range of Indian silver spiritual accessories. Our silver products help you & you’re dear ones to enhance your daily prayers, meditation and puja. • Brand : Sri Jagdamba pearls & gold Shipping Info: Ships within 6-7 working days.